● Every person who drives or rides in this vehicle should use a seat belt at all times. ● Do not ride in a moving vehicle when the seatback is reclined. This can be dangerous. The shoulder belt will not be against your body. In an accident, you could be thrown into it and receive neck or other serious injuries. You could also slide under the lap belt and receive serious internal injuries. ● For the most effective protection when the vehicle is in motion, the seat should be upright. Always sit well back in the seat with both feet on the floor and adjust the seat belt properly. ● Do not allow children to play with the seat belts. Most seating positions are equipped with Automatic Locking Retractor (ALR) mode seat belts. If the seat belt becomes wrapped around a child’s neck with the ALR mode activated, the child can be seriously injured or killed if the seat belt retracts and becomes tight. This can occur even if the vehicle is parked. Unbuckle the seat belt to release the child. If the seat belt cannot be unbuckled or is already unbuckled, release the child by cutting the seat belt with a suitable tool (such as a knife or scissors) to release the seat belt. 1. Adjust the seat. See “Seats” earlier in this section. 2 Slowly pull the seat belt out of the retractor and insert the tongue into the buckle until you hear and feel the latch engage. ● The retractor is designed to lock during a sudden stop or on impact. A slow pulling motion permits the seat belt to move, and allows you some freedom of movement in the seat. 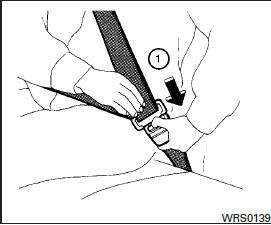 ● If the seat belt cannot be pulled from its fully retracted position, firmly pull the belt and release it. Then smoothly pull the belt out of the retractor. 3 Position the lap belt portion low and snug on the hips as shown. 4 Pull the shoulder belt portion toward the retractor to take up extra slack. Be sure the shoulder belt is routed over your shoulder and across your chest. When the ALR mode is activated, the seat belt cannot be extended again until the seat belt tongue is detached from the buckle and fully retracted. The seat belt returns to the ELR mode after the seat belt fully retracts. See “Child restraints” later in this section for more information. 1 To unfasten the seat belt, press the button on the buckle. The seat belt automatically retracts. Seat belt retractors are designed to lock seat belt movement by two separate methods: ● When the seat belt is pulled quickly from the retractor. ● When the vehicle slows down rapidly. To increase your confidence in the seat belts, check the operation as follows: ● Grasp the shoulder belt and pull forward quickly. The retractor should lock and restrict further belt movement. The shoulder belt anchor height should be adjusted to the position best for you. See “Precautions on seat belt usage” earlier in this section. To adjust, pull out the adjustment button 1 and move the shoulder belt anchor to the desired position 2 , so the belt passes over the center of the shoulder. The belt should be away from your face and neck, but not falling off your shoulder. Release the adjustment button to lock the shoulder belt anchor into position. ● After adjustment, release the adjustment button and try to move the shoulder belt anchor up and down to make sure it is securely fixed in position. ● The shoulder belt anchor height should be adjusted to the position best for you.